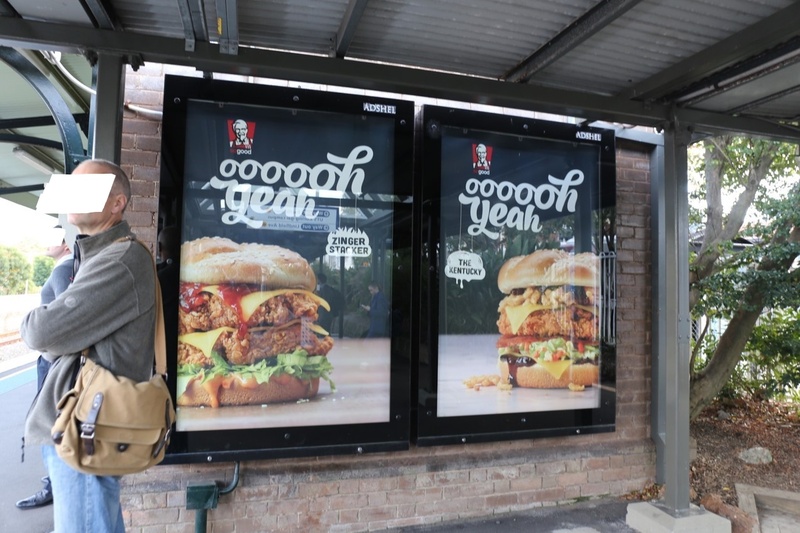 New research from the Boden Institute of Obesity, Nutrition, Exercise & Eating Disorders at the University of Sydney, and Sydney Law School, has investigated the quality of nutrition of food and beverage advertising on every station of Sydney’s metropolitan train network. Judged by revenues, outdoor advertising of food, on billboards and other advertising spaces, is on the rise. Sydney Trains generated over $12 million in advertising revenue in the 2013-14 financial year, and this was expected to increase to at least $100 million over the subsequent 5 years. A research team, led by Emma Sainsbury, collected data in February (summer) and July (winter) of 2016, photographing a total of 6931 advertisements across the 178 stations in the network. Each advertisement was coded as core (a healthy food or beverage recommended for daily consumption), or discretionary (high fat, sugar and/or salty food not recommended for daily consumption), based on the Australian Guide to Healthy Eating. The results tell you what you probably already know: Sydney train stations are a great place to advertise junk food and beverages. Just over a quarter of total advertisements (1915/6931, or 27.6%) promoted food and beverages. Of the food and beverage advertisements, 84.3% were for discretionary foods/beverages, 8% were for core foods/beverages, and the remainder (7.6%) were miscellaneous advertisements, mostly brand-only advertisements that did not mention specific products. Significantly, the core foods/beverages category consisted mostly of bottled water vending machines (74.4%), and billboard advertisements for bottled water (11%). When advertisements for bottled water were excluded, only 1.3% of food and beverage advertising on the Sydney train network was for core foods. The most commonly advertised discretionary products were potato chips (25%), sugar-sweetened beverages (23%, mostly flavoured milks and soft drinks), and intense or artificially-sweetened beverages (18.7%). Despite food advertisements comprising just over a quarter of all advertisements, Coca-Cola and PepsiCo (which includes PepsiCo beverages and The Smith’s Snackfood Company) were the largest advertisers overall, contributing 10.9% and 6.5% of total advertising across the network. Advertisements for alcohol made up over 6% of food and beverage advertising, and about 2% of total advertising. There is obviously a total disconnect between foods and beverages advertised on Sydney trains and the kinds of foods and drinks that make up a healthy diet. What do advertisers have against healthy food and beverages, I wonder? A large number of self-regulatory initiatives ostensibly regulate food and beverage advertising in Australia. However, these have failed to achieve a healthy food advertising environment, probably by design. The results of this study support the case for government to pressure industry to shift the mix of food and beverage advertising towards products that are more consistent with a healthy diet. The paper reviews some of the regulatory approaches that might be used, from outright bans, to interim and longer-term targets for reductions in the overall volume of unhealthy food advertising, based on a credible nutrient profiling system that evaluates the quality of nutrition of the product. Restrictions on the volume of particular kinds of advertising, as a percentage of total advertising, do exist in other jurisdictions. In Ireland, for example, the General Commercial Communications Code limits the volume of television advertising of foods high in fat, salt or sugar, to a maximum of 25% of sold advertising time across the broadcast day (para 16.10). However, much of the impetus for constraints on unhealthy food advertising arises from the belief that children are particularly vulnerable and deserve to be protected. Unlike, say, television programs that are made specifically for children, the train network is used by substantial numbers of both adults and children. Another approach could be to significantly increase the proportion of train station advertising allocated to the promotion of healthy, core foods and beverages, perhaps through higher pricing strategies for advertising of junk foods and sugary drinks. The food, beverage and advertising industries ought to be taking the lead here, but how likely is that?! The prevailing ideology, shared by the food and beverage industries, their allies and lobbies, is that you get the health you deserve. If you can beat temptation and eat a healthy diet, you deserve to be healthy. But if you eat a poor diet, if you routinely consume the diet that is overwhelmingly advertised, then you get what’s coming to you. It’s great for business (there’s great margins on nutritionally poor foods), but not great for the health budget, nor for individuals and families. Maybe that’s why the food and beverage industry needs round-the-clock lobbyists in Canberra to explain to politicians and the rest of us how the world works. Because otherwise someone might start asking crazy questions…like…Why shouldn’t the mix of advertising across the Sydney train netework be better aligned with a healthy diet? The paper can be downloaded free of charge here.